Data scientists travelled across the US on 10 transcontinental flights to investigate your risk of getting sick on a plane . They found that the people in the row directly in front of and behind an ill person are most likely to get sick. But your likelihood of catching another passenger’s illness drops outside the 3-row zone, or if you pick a window seat. There are still plenty of other ways to catch someone’s flu, cough, or cold while you’re travelling. Passengers who are stuck sitting next to, in front of, or behind a sick person on a plane: beware. There’s a pretty good chance you’ll catch their cough, cold, or flu. That’s the finding of a new study, which was funded by Boeing and conducted by in-flight data scientists from Emory University and Georgia Tech. For their research, a troupe of 10 data scientists embarked on five round-trip cross-country flights, most of which were fully booked and flew during the height of flu season. In the air, the scientists worked like a band of germ-sniffing spies: they documented how passengers moved around the cabin, took hundreds of environmental samples, and tested the planes for the presence of 18 common respiratory illnesses. The researchers used the data they collected about passengers’ in-flight movement to simulate how transmission might work when a person is sick. They found that passengers sitting in a sick flier’s row, or the row directly in front of or behind that germ-bag, will almost certainly come within a 1-meter (3.28-foot) radius of the sick person. Since the most common way to spread viruses like the flu is by sneezing, coughing or breathing on healthy people, spending hours in close proximity to a person who’s spewing virus particles is a near sure-fire way to get sick. The study takes as an example a sick person sitting in the aisle seat of a plane that has three seats per side. That person has a roughly 80% chance of infecting everyone in their row on that side of the aisle, as well as those in the rows directly in front and behind them on that side, the study found. On the other side of the aisle, the person in the aisle seat directly across from this hypothetical sick person also has an 80% chance of catching the bug. So do the people in the aisle seats one row ahead of and behind the sick individual. But the people sitting across the aisle from a germy person in a middle or a window seat are significantly more shielded from exposure, with just a 10-30% chance of infection. The researchers did not compare this scenario to one in which people are sitting near each other for long periods of time without the help of aeroplane air filters (like on a train, for example). Nonetheless, they concluded that the people who are farther than one row away from a sick person on a flight probably wouldn’t catch the illness, since most people on planes don’t interact with anyone besides their immediate seatmates, even when they get up. 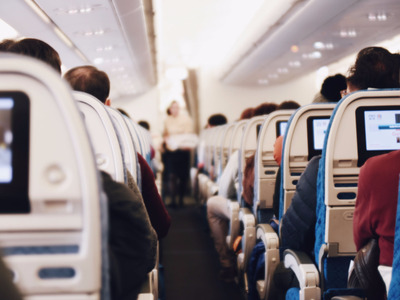 Even in-flight movements like getting up to open an overhead bin or go to the restroom had little effect on illness transmission beyond those three rows in the danger zone. Germs are “unlikely to be directly transmitted beyond 1 meter from the infectious passenger,” the study authors wrote. By their calculations, the best way to avoid catching germs is to get a window seat and stay there for the duration of the flight. Middle seats were rated second-safest, while the aisles were most dangerous for passing around and catching germs. That surprised lead study author Vicki Hertzberg, a professor of data science at Emory University. But it’s probably a good thing they didn’t, for the passengers’ sake. Some research suggests that illness droplets can travel as far as six feet away from a sick person, and flu particles can last for up to 24 hours on hard surfaces. So if you don’t wash your hands frequently, you’re going to be at risk while travelling, no matter where you sit on a plane. Some planes that were in the air in Asia during the 2003 SARS outbreak found that as much as 40% of the cabin was at risk of becoming infected with the deadly virus. For those reasons, the scientists behind this limited, US-based study were cautious about drawing any major conclusions. After all, a long international flight is bound to have more people getting up and milling around in the aisles. So there’s just no sure way to know what kinds of germs might await on your next flight.